Finding motivated seller leads is crucial for running a real estate investing company. With out leads, you don’t have a business. Essentially, motivated seller leads are the sellers who are actively looking for someone to buy their property. That’s where you, a real estate investor, comes in. 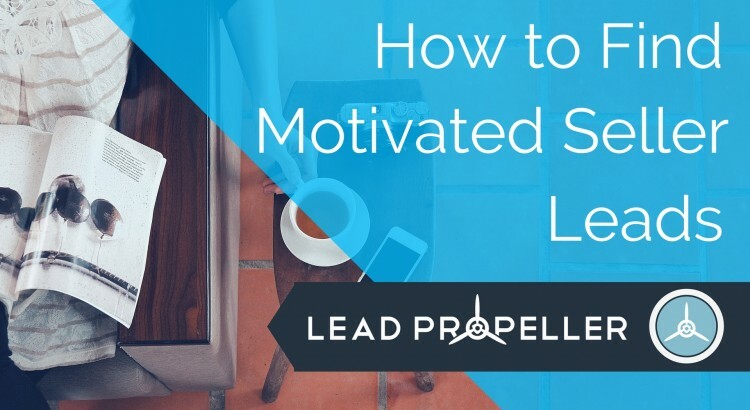 If you want your real estate business to survive, you’ll need to learn how to find motivated seller leads. It can be difficult to get deals if you’re having trouble finding leads, and I know how frustrating it can be to find motivated seller leads in this market. There are so many different ways to go about finding leads, and this article will educate you on all of them. From direct mail to driving through neighborhoods, by the end of this you will be an expert on how to find motivated seller leads for your real estate investing business. Direct mail is a great way to find motivated seller leads because it brings you directly to people in need of your services. Using direct mail is a great way to open communication with your target audience. With direct mail, you will be able to build a mailing list, effectively give out your contact information, and educate your audience on your services and latest deals for them. There are four steps to better optimizing your direct mailing list, as spelled out by Experian – an online insight journal. The steps are: identify your audience, target your audience, pick a type of direct mailing list, and send your direct mail. Because you already know who your target audience is, you know what they will be looking for in your direct mail strategies. The motivated sellers you will be mailing will want to sell their houses quickly with little to no hassle. By providing your mailing list with information on your real estate investor business – such as how to contact you, your location for buying and selling, and why they should use your services- you will be building communication with sellers. While direct mailing is easier than this approach, driving around neighborhoods is an equally effective way to find motivated seller leads. Essentially, this requires you to drive through your target area looking for distressed homes in need of selling. Identifying these houses can be tricky, but once you get the hang of it you will become an expert in the drive-for-dollars method. A distressed house will often have these similarities: piles of newspapers, city notices, abandoned mailboxes, overgrown lawns, boarded windows, and open fences. These houses are known as low-hanging-fruit for real estate investors, and often are great ways to find motivated seller leads. The difficulty with this method isn’t finding the house, it’s in landing the deal. Once a house is located, you will have to get in contact with the lead. Often times, owners of distressed houses are wary of people approaching them, so it’s important not to come off as a debt collector or city official. Communicating with these leads can be as simple as sending direct mail, emailing, calling, or simply knocking on their door. Once you get in contact with these leads, it is important to let them know that you are here to help them solve their housing problems. The more of a problem solver you can present yourself as, the more these motivated seller leads will be willing to work with you. And once you’ve got the lead motivated to work with you, closing the deal will happen in no time. Networking is important in growing any business, but especially for finding motivated seller leads. Networking can be anything from visiting local REIAs, to social media networking. Visiting local REIAs (or Real Estate Investment Associations) you will have the chance to network with other real estate investors. At REIA meetings, other people involved with real estate investing gather to network with one another, share lead information, and swap trade secrets. These sorts of meetings are a perfect way to get in touch with other local real estate investors. Once you have established a line of communication, people will be more willing to give you motivated seller lead information. For example, if you reach out to an investor who works primarily in one zip code area of your city and they find a motivated seller lead in your area, they will be likely to share that information with you. Likewise, networking online is another way to establish communication with other real estate investors as well as potential motivated seller leads. If you put your real estate company’s information on social platforms, people will stumble upon it during their daily surfing. Jay Baer, a writer for Convince & Convert online journal, found that “56% of Americans have a profile on [at least] one social networking site.” If over half of the nation is online for social networking purposes, you should be promoting your real estate business there. Using an online lead generator will dramatically help to find motivated seller leads. An online lead generator will make it so that motivated sellers will find you instead of the other way around. Using an online lead generator will save you time and energy, and free you up to convert your motivated seller leads into real estate deals. Online lead generators are a way to advertise your business online. It works like a website, or a squeeze page, where people looking for your service can find you. According to US News Real Estate, 80-90% of people who bought and sold houses in 2015 started their search online. That is the majority of the market that you can not capitalize on if you aren’t using a lead generation website. Think of it this way, if 80-90% of motivated seller leads start online, and you don’t have a website for them to visit, how are they going to know about your real estate business? They won’t, and you will be stuck trying to buy from the 10-20% of the market who are being confronted by other real estate investors. Finding motivated seller leads can be difficult, but if you use the guidelines we’ve given you, finding them should take no time at all. Always remember, motivated seller leads are the lifeblood of your real estate investing company. Leads become deals, and deals become business. By using direct mail marketing, driving door to door, networking, and using a lead generation tool, you too will be able to find motivated seller leads and convert those leads into deals.